Lee Kager, her twin brother James, their best friend Adam and their father have been shipwrecked on a sandbar near the shores of Horseshoe Island. Stranded several miles from the local shore with no means of communication and the ocean’s tide rising fast, the only thing standing between them and the shore is a shark with an appetite for human flesh. 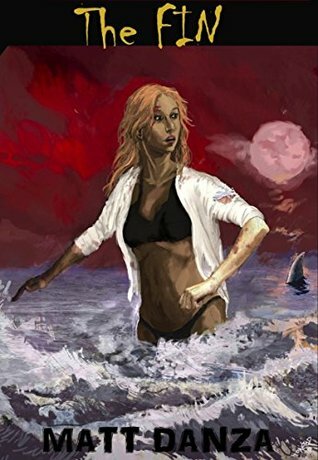 Join their quest for survival as they fight their way to shore. Inspired by the blockbuster hit, Jaws. Read the book before you go swimming, and know that fate, is only waist deep. I find sharks fascinating and terrifying. Which means it probably wasn't the smartest idea for me to read this a month before I go on vacation but too late. The beginning of the story was a little slow for me but it did pick up once the shark comes into the picture. The Fin is a short, well-written story that was very thrilling at times. I really liked Lee's character and I felt like I related a lot to her. Especially with how badly she wanted to get away from the island, I wanted to get away from my hometown just as badly. I liked her relationship with her brother and dad but I didn't connect as well with them. I like how the story progressed once the shark came along. There were moments in the beginning when I was unsure about the direction of the story and the authors style of writing. Thankfully, the shark scenes made up for anything uncertainties I had. I recommend this book to anyone that likes a good Jaws story.